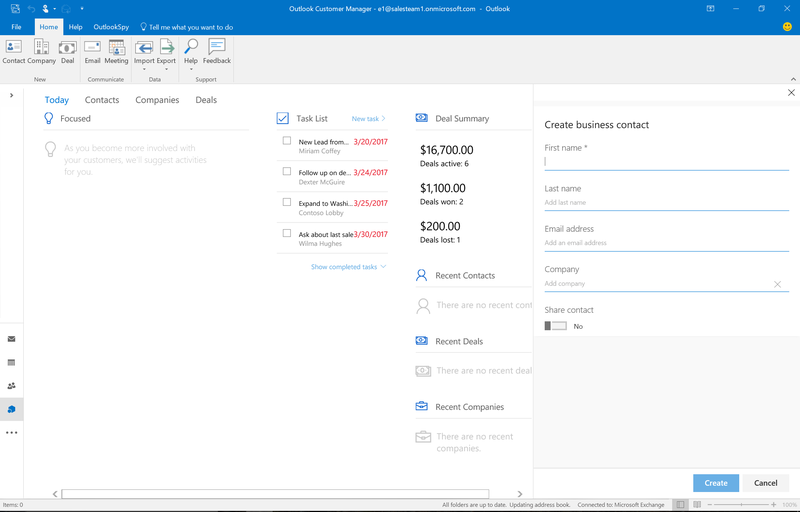 There are three main types of items you can create in Outlook Customer Manager: contacts, companies, and deals. Here is a short video on how you can use deals, and below there is more information on contacts and companies. Outlook Customer Manager works with your existing Outlook contacts. All of your current contacts are added automatically. You can also add new contacts from email messages or from the Contact pane. Open the email message and then choose Customer Manager on the ribbon. If you already have an entry for that sender, you'll see a screen with the existing contact's details. If Outlook Customer Manager doesn't find a matching entry, you'll see an Outlook Customer Manager contact screen with the option to Add as contact. Select Add as contact. This saves the contact and displays the contact detail screen. Verify the contact's name, add a company, and then choose Create to save the contact. When you add a task, deal, or log, it will also create a contact for you. If you want to add other contacts in the email to your contacts, choose Show all related. You'll be presented with other potential contacts to add. Choose Add-ins from the Outlook nav pane, then choose Contact in the New group of the Outlook Customer Manager ribbon. Enter the contact name, email address, and company, then choose Create. 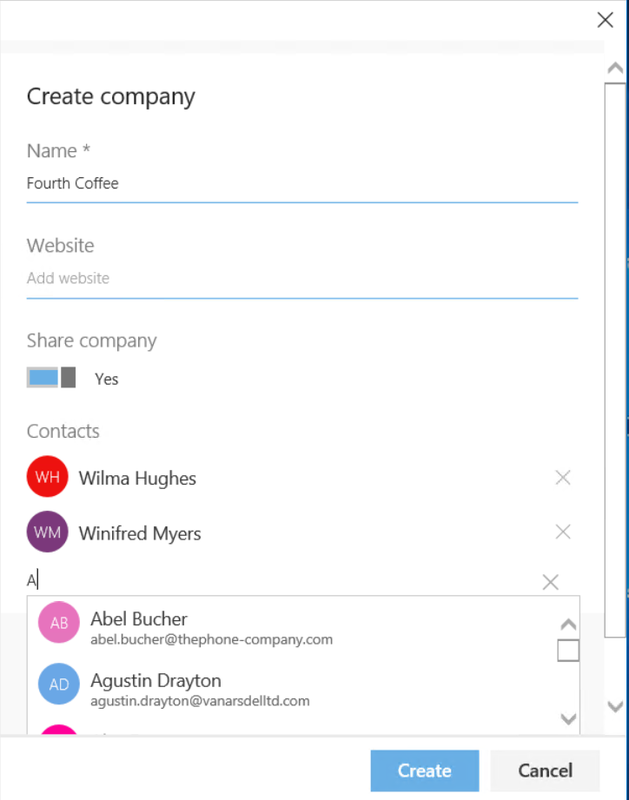 Choose Details on the contact card that appears on the right side of the Outlook Customer Manager window to add additional information such as phone number, birthday, and notes. Choose Save to update the contact. Within Outlook Customer Manager, you can mark any contact as a business contact. Then, when you're viewing your contacts, you can choose to see only business contacts. Any contact that you add to a company or a deal is automatically marked as a business contact. Choose Contacts from the Outlook Customer Manager home page. Select a contact from the list and then choose View Details. Scroll down and move the Business contact slider to the right ( yes), then choose Save. You can link multiple contacts to one company. Companies, contacts, and deals can each have their own activities. Choose Company from the New group on the Outlook Customer Manager ribbon. Enter the company name and website (optional), and then choose Create. Choose Details to fill in information such as the company's business address, phone number, email address, and any notes that apply to the entire company, and then choose Save. You can use deals to manage transactions or opportunities with your contacts. Deals can have start and end dates, goals, and activities of their own. Choose Deal from the New group on the Outlook Customer Manager ribbon. 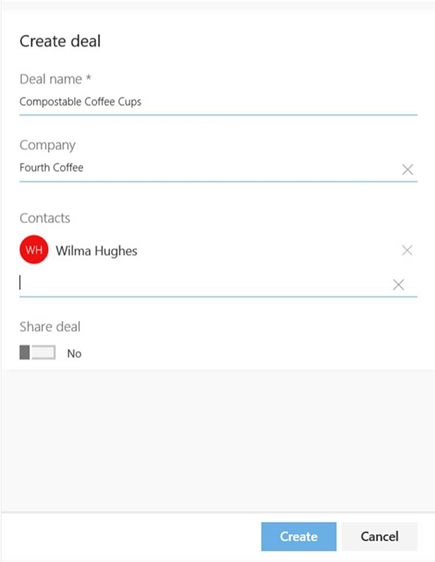 Enter the deal name, choose a company, and one or more contacts (optional), and then choose Create. Choose View details to fill in information such as the deal amount, priority, close date, and stage. When you're done, choose Save. When you add a new Outlook Customer Manager item, you can always specify a company or contact to associate with that item. For example, if you add Tony Smith as a contact, you can choose an existing company, Contoso, or you can enter a new company name, Fourth Coffee. If Outlook Customer Manager can't find an existing company, you'll be prompted to create a new company. When you create a new deal, you can choose an existing company or existing contacts, or create new ones right from the deal.